Truth be told, I haven't been reading much lately. The summer was just too much of a whirlwind and now that we're 'back to school' I'm finding that I have even less time - and energy - for reading. Many of my friends have been reading the 50 Shades of Grey trilogy but apparently doing so is a good way to get pregnant and I am not quite ready for that yet! 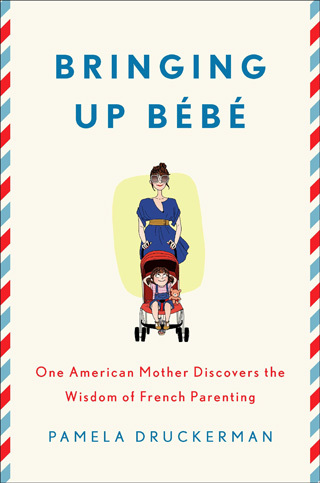 One of the books I did manage to read (slowly) over the summer was Bringing Up Bébé: One American Mother Discovers the Wisdom of French Parenting by Pamela Druckerman. There has been lots of buzz - good, bad and indifferent - about this book, but I found the topic of French vs. American parenting intriguing so I had to find out for myself. In Bringing Up Bébé Pamela Druckerman writes about her experiences as an American mother raising children in Paris with humour, wit and personal insight. Throughout the book she explores how French parents have children who sleep through the night, eat what is put in front of them and are expected to always use their manners. According to Druckerman, French parents don't hover over their children the way that North American parents do. Instead, they want their kids to develop autonomy and create this by allowing them to discover and do things on their own. What a refreshing idea! Bringing Up Bébé is a great read for any mother and definitely made me look at the way I parent. I want to be a mom who allows her children to play at the park without constant parental interference and raise kids who know that saying 'hello' and 'good-bye' is just as important as 'please' and 'thank you.' After reading this book, I am inspired to parent more like the French. Have a read of this excerpt from Bringing Up Bébé on the The Wall Street Journal.